← Did Jamal Yunos clobber Ratu Naga? 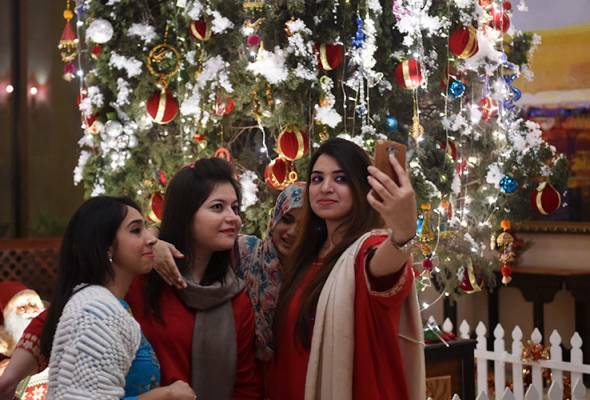 Will my Muslim friends be able to wish me ‘Merry Christmas’ with a clear conscience? A call for a return to the days when saying ‘Merry Christmas’ offended no one. During the days before Christmas last year, I wished my friends who were celebrating it “Merry Christmas” in much the same way they would wish me “Selamat Hari Raya” or “Happy Eid”. I find it rather sad that such a simple greeting – one which I grew up with and which I have never regarded as something that would compromise or de-value my own faith – is now regarded as something so religiously incorrect for us Malaysian-Muslims. When I was at boarding school in England, I had to go to church every Sunday because it was part of the rules. My father advised me to consider it as part of my “education” and he had no doubt that the experience would strengthen, rather than weaken, my own faith. I was able to see the similarities and differences between Christianity and Islam. I learned more than the average Malaysian-Muslim would about Christianity. I learnt that just as we Muslims categorise ourselves according to the four different schools of thought of the four Imams (Imam Malik, Imam Al Shafi, Imam Abu Hanifa and Imam Ahmad Abn Hambal) and are either Sunnis or Shias, so Christians too are divided into different sects or churches. Going to church did not make me less of a Muslim when I was a young girl, and neither does saying “Merry Christmas” make me less of a Muslim now. My faith has not been shaken just because I wished some friends a time of joy with their families. Neither will I suddenly suffer from amnesia and forget what my religion is. What I do not wish to forget, however, is that there are good, kind people who are not of the same faith as me. The prophets include not just Muhammad (May Peace Be Upon Him) as the last prophet and as the Messenger of Islam, but also in the 24 earlier ones who are mentioned in both the Bible and the Quran. Four of them are Ibrahim (Abraham), Musa (Moses), Daud (David), and Isa (Jesus). So, if Christmas is the celebration of the birth of Isa (Jesus), a prophet respected and revered in Islam, is it so wrong to wish a blessed day for those who celebrate it? We are now in the second decade of the 21st century. Surely, we should, now more than ever, be far more enlightened at a time when information of any sort and of all kinds are so readily available to us. What is most important is that we regard one another as fellow citizens and treat each other with respect, regardless of our race or religion. The writer is a Royal Fellow, School of Language Studies and Linguistics, Universiti Kebangsaan Malaysia (UKM), and holds a BA (Honours) degree in Chinese Studies, University of Oxford. The writer is also the Permaisuri of Johor. With Christmas looming this Thursday, Ikatan Muslimin Malaysia (Isma) has once again stirred up controversy by saying Malays should not wish Christians “Merry Christmas” and celebrate along with them. According to Isma activist Abu Ameen in his commentary, while it was natural for Muslims to show kindness to their fellow neighbours as part of Allah’s commandments, the community should also ask themselves whether this gesture is permissible under Islam. “Especially at this time and age, Muslims should not be singled out as being unfriendly or not part of the community. Abu said while classical and traditional scholars considered wishing Merry Christmas as “haram” (forbidden), contemporary scholars ruled it as “harus” (permissible). “I don’t need to explain each position in detail here as one could easily Google them on the Internet and find out what is the majority of Islamic scholars’ position on this matter. “In fact, Isma had clarified Islam’s position a couple of years back in 2012 (refer http://www.ismaweb.net/2012/02/pandangan-muis-berkenaan-meraikan-perayaan-agama-bukan-islam/) which is more suited for the multicultural condition in Malaysia,” he said. As such, Abu said that as Muslims, they should be clear that though they would like to use the “Merry Christmas” wish and celebration as a bridge to da’wah (preach), they should also not take for granted that in da’wah (preaching), if it was wrong, meant that it should be completely avoided. Abu expressed that he personally preferred to follow the traditional and conservative scholars’ view on the matter. Citing an Islamic scholar Sheikh Muhammed Salih Al-Munajjid who had responded to the issue, Abu said that the reasons to shun Christmas greetings and celebrations is due to respect for Allah, Jesus and the teaching of our Prophet Muhammad. “You (The non-Muslims) seem to have misinterpreted the condemnation of celebration of Christmas as a matter of disrespect for Christians. “It is an integral part of our faith to reject celebrations that have not been prescribed and/or that have a basis in falsehood, as inevitably they lead to misguidance and alterations in faith, as has happened in Christianity,” he said. Its sad that in Malaysia a mufti has to say this, but I’m glad he said it. Merry Christmas! KUALA LUMPUR, Dec 20 — Muslims are permitted by their faith to wish Christians “Merry Christmas”, Federal Territories Mufti Datuk Dr Zulkifli Mohamad Al-Bakri said. He cited the Muzakarah National Fatwa Committee Council in Islamic Affairs’ 78th meeting in 2007 that had concluded that sending greetings through cards, emails or text messages to non-Muslims during their festive seasons was permissible (“harus”), as long as such greetings did not glorify non-Muslim faiths or use religious symbols. “It can be understood that the Merry Christmas greeting is permissible when it is a congratulatory expression on the celebration of other faiths without glorifying their religion. “It’s no more than a mere greeting to express happiness and enjoyment upon seeing the happiness of those celebrating,” he said in a statement yesterday. This entry was posted in Uncategorized and tagged Islam, malaysia, politics, religion, sultanah of johore, Xmas greetings. Bookmark the permalink. 1 Response to Will my Muslim friends be able to wish me ‘Merry Christmas’ with a clear conscience?